What a great value! Three Professional Hair care products made from Dead Sea minerals and vitamins by Sea of Spa combine into one great deal to pamper your hair or give as a gift to show someone you care. 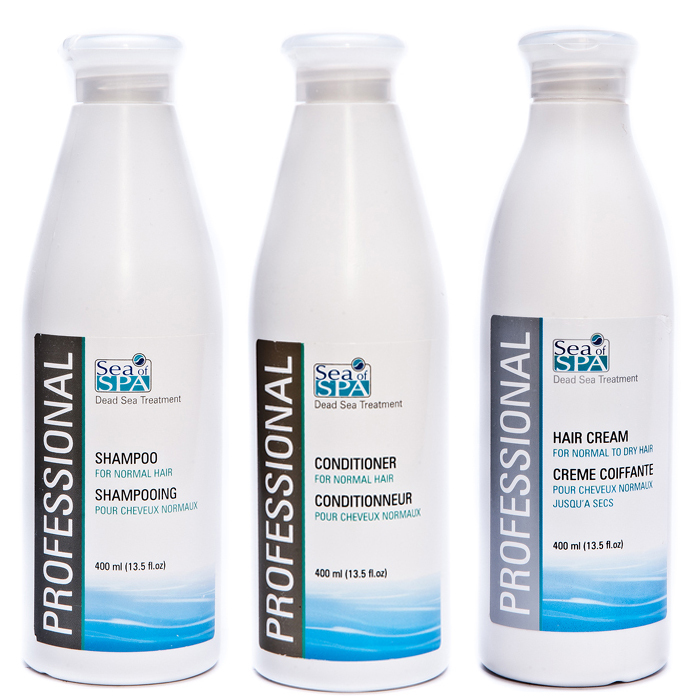 This economical package comes with one 400ml bottle each of Dead Sea Shampoo, Conditioner and nourishing Hair cream. All part of a daily routine to maintain and enhance the beauty and shine of your healthy hair. Shampoo: Professional Dead Sea mineral based shampoo with a mild formula enriched with plant extracts and vitamins that nourish your hair and prevent it from breakage; It also contains aloe vera juice to calm the skin of the sculp and retain necessary moisture. Keeps your hair healthy and strong. Avoid contact with eyes. This shampoo is appropriate for normal, dry, oily or colored hair. Conditioner : Professional formulated Dead Sea minerals based conditioner with plants and vitamins to smooth out the hair, seal the moisture and add shine. Your hair will be easy to comb and style and look gorgeous all day long. Can be used with normal, dry or colored hair on a daily basis. Hair Cream: Professional formula hair cream based on Dead Sea minerals, papaya extract and citronella oil makes the hair lustrous and radiant. Enriched with natural oils, such as Sweet Almond Oil, Olive Oil, Carrot Seed Oil, this gentle hair cream works to maintain the scalp's natural moisture balace. The Dead Sea minerals together with pro-Vitamin B5 and Vitamin E revitalize and nurture the hair while protecting it from harsht weather conditions.